Cross-country skiing in the High Sierras brings you closer to nature. Nordic skiing in Yosemite takes you to the roof of the world with near-total solitude. Overnight in well- appointed wilderness huts as you cross from ridge to ridge, traversing the vast expanse of parkland. Yosemite features almost 350 miles of skiable trails and roads, including ten alpine ski trails and 90 miles of marked XC trails that begin at Badger Pass. In addition to areas around Badger Pass, marked winter trails are available at Crane Flat, in Yosemite’s backcountry and among the Giant Sequoias of the Mariposa Grove. Tuolumne Meadows is also a popular destination for skilled wilderness skiers. Cross-country skiing in Yosemite is usually best in the high country above popular Yosemite Valley. You can rent skis and snowshoes at the well-equipped Nordic Center at Badger Pass, California’s oldest wintersports area. Visitors in late winter and early spring hit the trail there, 7,200 feet above sea level, and ski or snow-shoe up the road past a number of inviting campsites. The road eventually climbs to about 8,000 feet above sea level before dropping to 7,200-foot-high Glacier Point. Though the trip can be done in one long day by strong Nordic and skating skiers, an outing of at least two days is far more relaxing. Easily the best way to visit Glacier Point is to book an overnight trip with the Yosemite Cross-Country Ski School. Most wilderness users will find the best day and overnight trail options leaving from the Badger Pass area. There are more than 50 miles of marked trails and the Glacier Point Road beyond Badger pass is groomed. 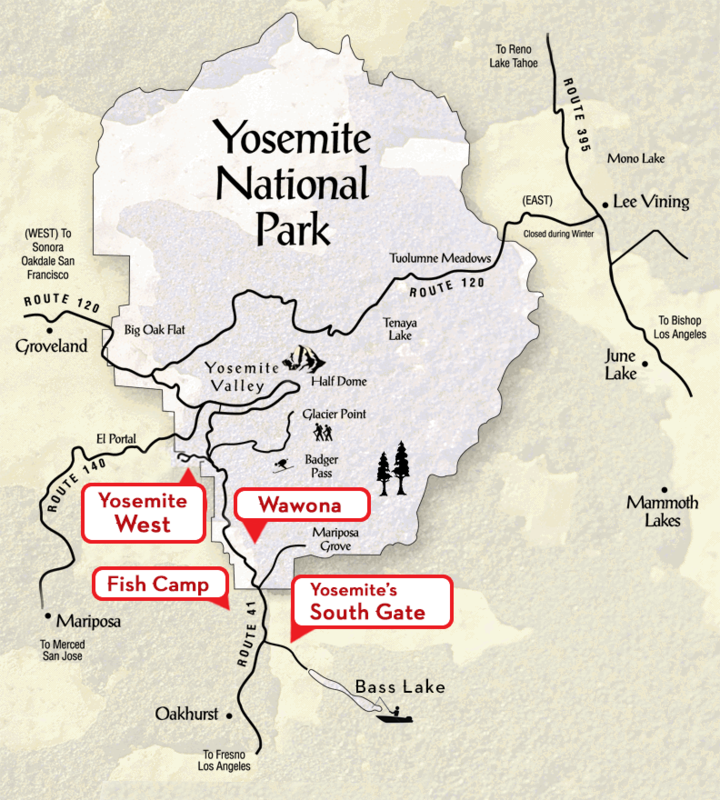 The Yosemite Cross Country Center operates overnight guided ski trips to Glacier Point, for information about this trip and equipment rentals call 209-372-8444. All overnight users are required to register for overnight parking at the Badger Ranger Station. Please use good judgment in assessing your ability to cross-wilderness areas in the winter. You are on Mother Nature’s terms out here and she reigns supreme. Dress in layers of synthetic clothing (polypropylene, Fleece, Gore-Tex, etc.) for warmth and be sure to bring along plenty of water and high-energy foods, as wintertime weather can be brutal. All winter wilderness travelers should be prepared for sudden storms. If you are not familiar with assessing avalanche conditions it is highly recommended that you ski on the marked trails at Badger pass, Crane Flat and the Mariposa Grove. For updated Tuolumne information call 372-0450 between 8:00 am and 5:00 pm. For downhill and cross-country ski school information and conditions, call 209-372-1000. For Ostrander Ski Hut reservations call 209-372-0740, Monday through Friday, 9:00 a.m. to 4:00 p.m. Pacific Time.